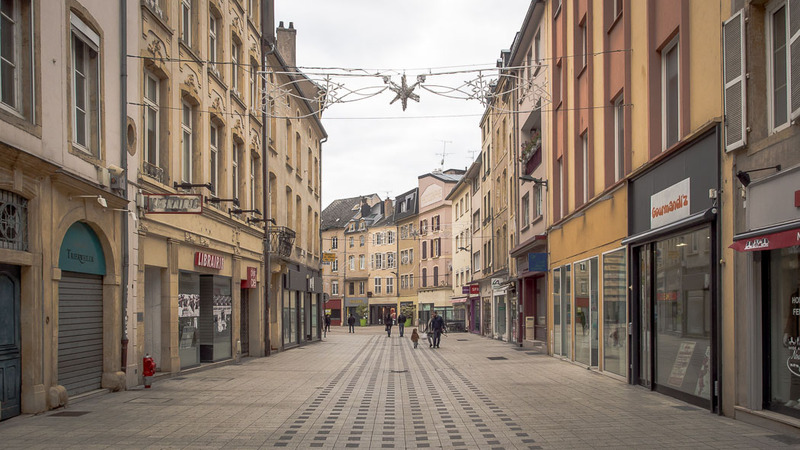 On a normal business day Thionville has a network of streets and shopping malls which seem way out of proportion to what one perceives to be the size of the town. The number of vacant tenancies on the outer edges of the business district would tend to bear out that perception somewhat, but perversely perhaps, this being Sunday, and all shops closed and shuttered the vacancy rate was not quite as obvious. It’s the sort of place that one would like to like, but it’s also the sort of place where one wonders if the Christmas lights are up early, or whether they’ve been left there all year. One would suspect the latter, as there are lots of them and they are quite complicated arrangements, different in every street. Perhaps not. The Christmas markets in Thionville are barely six weeks away and given the number of lights erected, it will probably take that long to fill all the bulbs with electricity. We can only imagine how spectacular they’d look at night, with a covering of frost, but by the time that happens the only ice we’ll be seeing will be in the bottom of a tall glass.